Acute cholecystitis (AC) is severe inflammation of the gallbladder (GB) with intense abdominal pain dominating the clinical presentation. AC is divided into acute calculous cholecystitis (ACC) and acute acalculous cholecystitis (AAC). ACC represents over 90% of all AC cases,1 initiated by a sentinel event of an obstructing gallstone in the gallbladder neck or cystic duct. The pathophysiology of AAC is multifactorial and not completely understood, except that an obstructing gallstone is absent. In both types, bile stasis in the GB is the centerpiece, leading to release of bile salts with detergent action that injures the GB. This precipitates release of inflammatory mediators and secretion of an inflammatory transudate by the GB wall that, in turn, elevates the pressure and causes GB distention – the key reason for the abdominal colic pain.2 As edema and inflammation continue, ischemia and necrosis extend to include the entire thickness of the GB wall, creating a fertile ground for bacterial infection, which is found in 20-75% of bile from cholecystectomy specimens.3-5 AC is often superimposed on chronic cholecystitis (CC), particularly in ACC cases. Abdominal ultrasound (AUS) remains the initial imaging test of choice for patients suspected of AC, which can be quickly performed at bed side and does not expose patients to ionizing radiation.13 Because AUS can also assesses other abdominal organs that could be responsible for the patient’s abdominal pain while contributing no radiation exposure, it holds the rightful place at the top of imaging work-up. AUS has high accuracy for the diagnosis of acute cholecystitis, and has not been shown to be significantly inferior to any other test.14,15 The positive predictive value of demonstrating stones and a positive sonographic Murphy’s sign (pain elicited by pressing on the GB with transducer) is 92%, and that of stones and thickening of the GB wall is 95%.16 The negative predictive value of the absence of stones combined with either a normal wall or negative Murphy’s sign is 95%.16 However, study quality depends on operator skill and there is great variability in diagnostic criteria among investigators and practitioners. 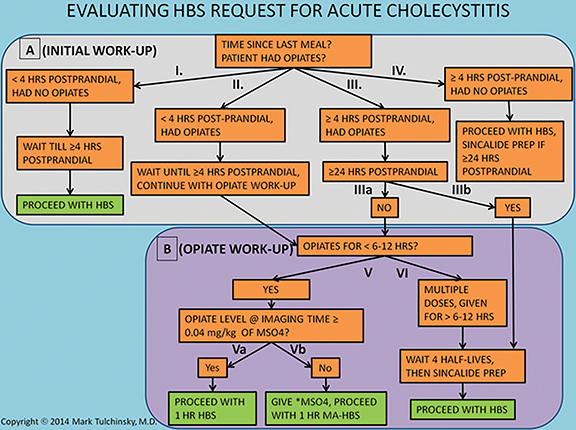 As a result, AUS may either fail to make an accurate diagnosis when there is high clinical suspicion of acute cholecystitis or yield equivocal results that could be more specifically characterized by hepatobiliary scintigraphy (HBS). Alternative morphological imaging tests which can be used to diagnosis acute cholecystitis include computed tomography (CT) and magnetic resonance imaging (MRI). Studies have demonstrated that CT only visualizes 65-75% of gallstones (inferior to US), and even then it is a nonspecific finding for AC.17 There are multiple associated CT findings that suggest the diagnosis of acute cholecystitis including GB distention, increased wall thickening in a noncollapsed GB, mucosal hyperenhancement, hyperemia in the GB fossa (CT “rim sign”), and pericholecystic fat stranding (increased density) and/or fluid.18 However, these findings lack sufficient sensitivity and specificity. MR demonstrates gallstones nearly as well as ultrasound.19,20 Gallbladder wall enhancement, adjacent pericholecystic fluid, and tissue irregularities are well seen with MRI.21-26 While there is potential to directly demonstrate cystic duct patency with MRI either by administering cholecystokinin to identify GB contraction or by the administration of MR biliary contrast agents,27,28 these techniques would add time and complexity to biliary examinations and would not be expected to outperform a more cost efficient HBS. Thus MR has been reserved for cases in which choledocholithiasis is the main consideration or in pregnant patients where radiation exposure is of greatest concern. 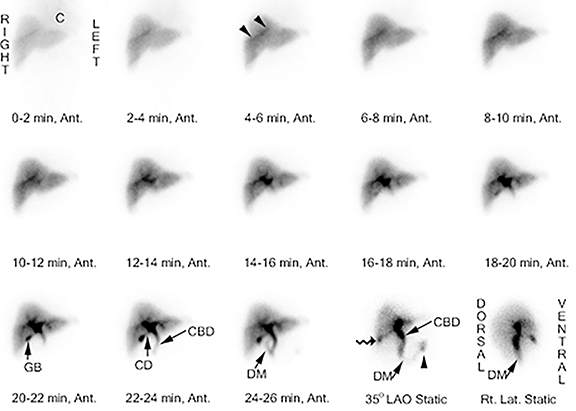 Inflammation imaging with 67Ga citrate can show GB wall inflammation on planar scintigraphy in AC.29, 30 Based on anecdotal reports, it appears useful with modern application of SPECT/CT.31,32 111In labeled white blood cells can show similar findings as 67Ga citrate.33-35 The tracer typically accumulates in the GB wall on these studies, showing photopenic center surrounded by an increased rim of tracer activity. Inflammation imaging can be useful in AAC when on occasion the cystic duct remains patent. The need for 6-48 hrs delay imaging represents the main limitation of this technique. HBS is aimed at testing the patency of the cystic duct, which is classically obstructed and considered to be the most specific diagnostic finding of AC. A recent meta-analysis concluded that HBS had the highest diagnostic accuracy among all imaging modalities in the diagnosis of acute cholecystitis, while AUS and MR had substantial margin of error.36 HBS is commonly used to clarify equivocal findings on anatomically-based imaging modalities. HBS can also be used prior to percutaneous cholecystostomy tube placement to establish that the cystic duct is obstructed, even if AUS findings appear diagnostic of AC. 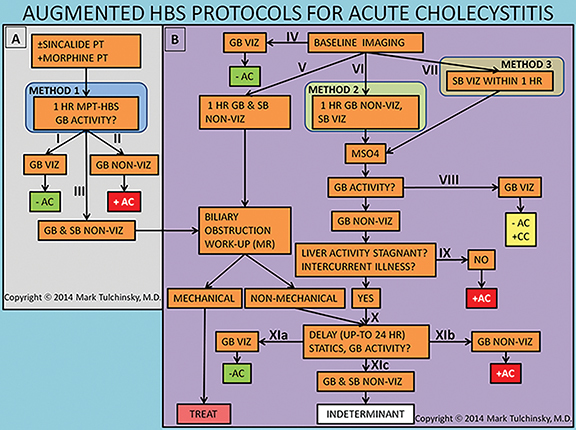 Therefore, HBS remains an excellent second tier test in the work-up of acute cholecystitis. This review article will focus on the technique, interpretation, and the pitfalls of HBS. A key element to an accurate HBS study is a proper patient preparation that begins with consideration of request for HBS (Figure 1). Bile flow in the biliary system and particularly the GB is highly dependent on the time elapsed from the last meal. Hence, this is the first main preparation modifier to clarify. In the early post prandial state (< 4 hrs), the GB is contracted under the influence of intrinsic cholecystokinin stimulation and the bile flow from the liver has slim to no chance of entering it. If studied in such condition, radiolabeled bile will bypass the GB, typically yielding a false positive study in patients with a patent cystic duct.37,38 Alternatively, fasting for a long period of time (usually greater than 24 hrs) results in a GB filled to its maximal capacity with viscous concentrated bile. If studied in this condition the newly secreted radiolabeled bile may not be able to enter either,39 which could also cause false GB non-visualization (non-viz). The current standard of practice recommends fasting for a minimum of 4-6 hrs before HBS.40-42 If the patient has been fasting for greater than 24 hrs, then pretreatment with 0.02 mcg/kg sincalide (a synthetic analog of cholecystokinin) infused over 15 to 60 minutes, followed by a 20-min wait before radiotracer injection,42 would evacuate the bile from the GB and facilitate reentry of freshly radiolabeled bile into the refilling GB. Pretreatment with 0.02 mcg/kg sincalide over 60 minutes would result in the most optimal GB emptying.43 It is most efficient to administer sincalide pretreatment at the site of patients’ care (medical wards, emergency room, etc. ), right before transporting for the imaging. Establishing standard order set for sincalide pretreatment in the hospital electronic order entry system allows for a seamless pretreatment at the patients’ site of care by either a primary or imaging provider. Patient history and medical record should be carefully scrutinized for recent opiate use, which is the second most important preparation modifier. Morphine and other opiates cause sphincter of Oddi constriction resulting in the backflow of bile and filling of the GB. If enough time has elapsed since the initiation of opiate-containing therapy to cause maximal filling of the GB, then the radiolabeled bile may not be able to enter it – a situation similar to cases in which the patient has been fasting for more than 24 hrs. It is not known exactly how long after the start of morphine treatment the GB reaches the state of maximal distention and bile concentration, but it is unlikely to be reached within the first 6-12 hrs. If none of the two questions present an obstacle to starting HBS, the patient can be studied with unaided protocol, as described in Figure 2. In the event fasting requirements have been fulfilled and the patient received therapeutic opiates for no longer than the past 6-12 hrs, then HBS should be performed as soon as possible using morphine-pretreated HBS protocol, as described in Figure 3, option 1. If the patient received or remaining at the study time morphine equivalent dose is less than 0.04 mg/kg, then an additional dose of morphine should be given to bring it up to 0.04 mg/kg, which would ensure optimal sphincter contraction. For longer term and multi-dose opiate use, it is recommended delaying hepatobiliary imaging for at least 4 half-lives prior to radiotracer administration.42 However, this concern about opiate therapy and the approach described above for dealing with it has never been substantiated in clinical trials. Two radiopharmaceuticals are commonly used for hepatobiliary imaging: Tc-99m-disofenin and Tc-99m-mebrofenin (TMF). TMF is the more liver-specific agent, with 98% being cleared by the liver and 2% by the urinary system within 24 hrs.45 Tc-99m-disofenin is less liver specific (88% hepatic elimination), but this difference is not clinically significant for patients with normal hepatic function who are evaluated for AC. The suggested doses are 3 -5 mCi for adults with total bilirubin < 2 mg/dL and 0.05 mCi/kg (minimum of 0.5 and maximum of 3 mCi) for children. For adults with elevated bilirubin, consideration should be given to administering Tc-99m-mebrofenin in higher activity (7.5 mCi for a total bilirubin > 2 mg/dL and 10 mCi for a total bilirubin > 10 mg/dL). Interestingly, Tc-99m-labeled myocardial perfusion agents, such as sestamibi and tetrofosmin, have been used for HBS and GB testing, as they are predominantly eliminated via hepatobiliary excretion. Imaging is obtained with a large-field-of-view gamma-camera using a 128 x 128 matrix equipped with a low energy all-purpose or high-resolution collimator. Dynamic acquisition in the anterior view should be performed over 60 minutes at a rate of 1 min per frame. The images may then be reformatted into 4 min per frame for one screen display of resulting 15 frames. Additional planar views (right lateral, left anterior oblique and/or right anterior oblique) and SPECT/CT may be obtained as needed (up to 24 hr post injection) for clarification of GB visualization (Figure 4A-D). The images should be closely scrutinized for gallbladder visualization (GB viz). If there is GB viz, then the study can be terminated and interpreted as negative for acute cholecystitis. In the event of GB non-viz, there are 3 courses of action. In the first scenario with normal liver washout of radiotracer the delayed imaging would be performed at or after 4 hrs. In the second scenario the washout may be slow, such as in cases with compromised hepatocellular function or intercurrent disease, requiring longer delays of up to 24 hrs. Because biliary flow is severely reduced, the typical 4 hr delay may not be adequate for radiotracer to enter the GB, resulting in false-positive GB non-viz. 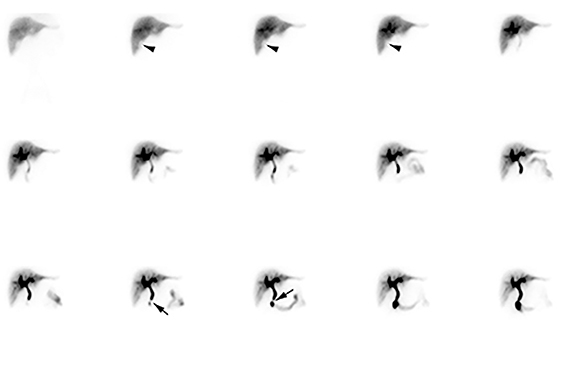 The 24 hr delayed images improve specificity by reducing these false-positive results. In the third scenario, morphine is administered to expedite GB filling (see Figure 3) and imaging is continued for an additional 30 to 60 minutes. For all three scenarios, if the GB is still not visualized on delayed imaging, then the study is interpreted as positive for acute cholecystitis. Alternatively, visualization of the GB after 1 hr of imaging suggests the diagnosis of chronic cholecystitis, if there is no other obvious reason (such as poor liver function) for the delay. Studies have shown that morphine-augmented HBS (MA-HBS) shortens the study and improves its specificity.46 Multiple investigations confirmed the diagnostic accuracy of MA-HBS, showing average sensitivity of 96% and specificity of 89%.47-60 The optimal dose of morphine sulfate is 0.04 mg/kg, and lower morphine doses (such as standard 2 mg, independent of weight) may not be sufficient to cause adequate contraction of the sphincter of Oddi.61,62 Some suggest that it is important to make sure that activity is seen in the bowel before morphine injection to exclude significant CBD obstruction.53,56 However, Louridas et al. gave morphine simultaneously with the HBS radiotracer (i.e. morphine pretreatment) to patients without clinical signs of biliary obstruction and reported no clinically insignificant side effects.49 This approach is certainly the most time and effort efficient. There are 3 variations of the MA-HBS technique. In the first variation, the patient is first pretreated with sincalide followed 15 minutes later by simultaneous injection of morphine and the radiotracer. The study is negative for AC as soon as the GB is clearly visualized (Figure 5), which by definition happens before 60 min. This is the most expeditious technique that takes the least resources and time in the imaging department. The study is positive for AC (Figure 6) if the GB is not visualized within 1 hr and the hepatic radiotracer washout is normal.49 The approach can be simplified by skipping on sincalide pretreatment if the patient has been fasting for > 4, but < 24 hrs. If sincalide administration is necessary, it can be ordered and administered at the point of primary care (emergency room or the hospital ward) right before the patient is sent to nuclear medicine. It is most practical and time-efficient with this approach to have morphine also administered at the point of primary care right before the patient is sent to nuclear medicine and about 20 min following sincalide, which alleviates the often complicated handling of morphine administration in the diagnostic areas. As with any variation of HBS, if the patient is very sick or has poor hepatic radiotracer washout, delaying imaging for up to 24 hrs would be advisable to increase specificity of HBS. In the second variation, the baseline HBS shows GB non-viz by the end of 1 hr of imaging. Morphine sulfate is then administered intravenously in 10 mL of saline over 2 to 3 minutes with imaging continued for another 30 to 60 min. The study is positive for AC if GB non-viz continues. If there is GB viz, then the reported diagnosis is CC. The third variation reduces study time by administering morphine as soon as tracer is visualized in the small bowel during the first hr of imaging, which could happen as early as 30 minutes or as late as 1 hr or later. The study is positive for AC if there is GB non-viz by the end of 30 minute of imaging after morphine administration. The insignificant drawback of the first and the third variations are that the diagnosis of CC (defined as GB non-viz for at least 1 hr) is not possible. While the primary reason for performing HBS is to assess for cystic duct patency, careful attention must be paid to ancillary findings in the surrounding organs for pathology that could be either incidental or sometimes lead to an alternative etiology for the abdominal pain. Hepatocyte function can be assessed by observing the rate of Tc-99m-mebrofenin clearance by the liver parenchyma. This can be evaluated qualitatively by noticing the time of its clearance from the cardiac blood pool. The rate should be defined as normal (the tracer is concentrated in parenchyma and none seen in the blood pool 5 minutes after administration), moderately decreased (activity is clearly seen in the blood pool of the heart for up to 20 minutes), or severely decreased (blood pool activity persists for 60 minutes). 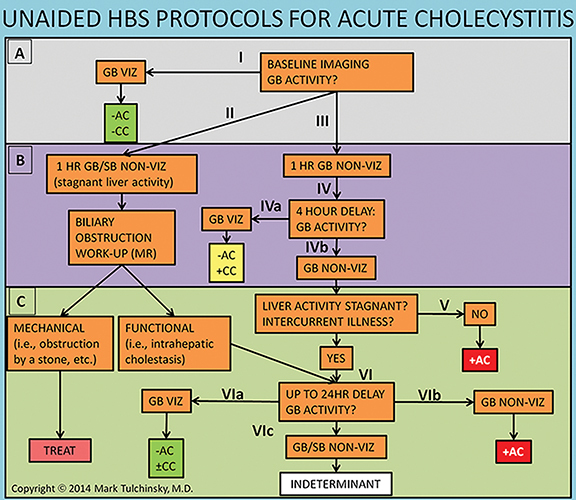 In the case of poor hepatocellular function, activity may not be visualized in the GB lumen whether acute cholecystitis is present or not, and longer imaging times (up to 24 hrs) should be allowed for evaluation. If liver function is severely compromised, then the study may be deemed indeterminate. In addition to hepatocellular function, diagnostic information can be obtained from assessment of liver size, contour, and homogeneity of tracer uptake. Both benign and malignant liver lesions may manifest as areas of photopenia, such as liver abscesses that could be responsible for patient’s abdominal pain and fever or hepatocellular carcinoma. A cirrhotic liver may appear shrunken with surrounding photopenia reflecting ascites. . However, most of these finding will be expected in this era of liberal CT utilization. The transit of radiotracer through the biliary tree can help in the assessment of biliary duct patency. Following radiotracer administration, activity is typically seen in the biliary radicals and common bile duct in approximately 15 – 30 minutes and in the small bowel within 1 hr. Failure of radiotracer to leave the liver (“dense liver staining”) or delayed small bowel visualization may result from either obstructive (choledocholithiasis, obstructing pancreatic mass, cholangitis, cholangiocarcinoma) or nonobstructive (hepatocyte dysfunction, hepatitis, or drug-induced hepatotoxicity) cholestasis. Patients pretreated with sincalide may have delayed visualization of small bowel as the pre-emptied GB is readily receiving incoming bile during its relaxation from recent contraction, diverting bile flow towards the GB and away from sphincter of Oddi, which is expected to be physiologically closed.63 After administration of morphine it is expected that the activity in the biliary tree will be intensified as it accumulates proximal to the sphincter of Oddi. It has been suggested that if after the morphine administration this pattern is not observed one should suspect either inadequate morphine dose or possible prior sphincterotomy. The most frequent pattern consists of radiotracer visualized in the GB lumen within one hr with normal liver uptake and prompt radiotracer excretion into small bowel – a “normal study.” Another pattern, known as “delayed gallbladder visualization,” demonstrates radiotracer activity in the GB lumen after one hr. While most of these cases are diagnosed with CC, a few have been shown to represent acute cholecystitis at surgery – false negatives.72 An additional imaging pattern demonstrates faint activity in the GB lumen in 1-1.5 hrs with delayed transit into the small bowel. It is unclear whether the faint activity in the GB lumen occurs in the first hr or is delayed. The majority of these cases were eventually shown to have choledocholithiasis with concurrent chronic cholecystitis. A final imaging pattern, known as the “rim sign,” consists of increased pericholecystic hepatic uptake and has been shown to highly correlate with gangrenous cholecystitis.73 In this circumstance, open cholecystectomy is preferred over laparoscopic cholecystectomy because there is a higher incidence of adhesions between the GB and liver which complicates laparoscopic surgery.73 It has been proposed that if the rim sign is visualized, then the study can be terminated early. However, there is no prospectively collected evidence for the accuracy for this approach and a false positive rim sign is common. Therefore, documenting GB non-viz is recommended as the primary criteria for AC diagnosis, using the rim sign to suggest gangrenous transformation. While HBS is a highly sensitive and highly specific test, like any test, it is susceptible to false positive and false negative results. Careful evaluation of patients’ medical record and comparison with prior imaging usually helps to avoid most pitfalls. The majority of false-positive results occur in cases of chronic cholecystitis41,74-77 Arguments are made that given their intractable pain, these patients should have probably undergone cholecystectomy anyway, regardless of whether they have AC or CC.74 Additional causes of false positive studies include prior surgical removal or congenital absence of the GB,78,79 choledochal cysts,80 cystic fibrosis,81 inflammation within immediate proximity of the GB fossa,82,83 ruptured hydatid cyst into the biliary tree,84 unusually elongated GB that is mistaken for bowel,85 primary or secondary GB neoplasms,86-88 severe illness,51,89 ceftriaxone therapy,90 and sphincterotomy.91-94 As discussed earlier, prolonged fasting (>24 hrs) and use of opioids prior to the study are also common causes of false positive results. Acute cholecystitis is a common cause of acute abdominal pain. While AUS remains the first-line test because of good diagnostic characteristics, the lack of patient exposure to ionizing radiation and the ability to perform the study at the bedside, HBS is a defining second-line test in equivocal AUS studies. Therefore, detailed understanding of study technique, imaging interpretation, and study pitfalls is essential to any practicing radiologist. Strasberg SM. Clinical practice. Acute calculous cholecystitis. N Engl J Med. 2008;358:2804-2811. Carter HR, Cox RL Polk HC, Jr. Operative therapy for cholecystitis and cholelithiasis: Trends over three decades. Am Surg. 1987;53:565-568. Claesson BE. Microflora of the biliary tree and liver--clinical correlates. Dig Dis. 1986;4:93-118. Claesson BE, Holmlund DE Matzsch TW. Microflora of the gallbladder related to duration of acute cholecystitis. Surg Gynecol Obstet. 1986;162:531-535. Kuo CH, Changchien CS, Chen JJ, et al. Septic acute cholecystitis. Scand J Gastroenterol. 1995;30:272-275. Schofield PF, Hulton NR Baildam AD. Is it acute cholecystitis? Ann R Coll Surg Engl. 1986;68:14-16. Trowbridge RL, Rutkowski NK Shojania KG. Does this patient have acute cholecystitis? Jama. 2003;289:80-86. Essenhigh DM. Management of acute cholecystitis. Br J Surg. 1966;53:1032-1038. Halasz NA. Counterfeit cholecystitis, a common diagnostic dilemma. Am J Surg. 1975;130:189-193. Chang TC, Lin MT, Wu MH, et al. Evaluation of early versus delayed laparoscopic cholecystectomy in the treatment of acute cholecystitis. Hepatogastroenterology. 2009;56:26-28. Gurusamy KS, Samraj K, Fusai G, Davidson BR. Early versus delayed laparoscopic cholecystectomy for biliary colic. Cochrane Database Syst Rev. 2008;CD007196. Lau H, Lo CY, Patil NG, Yuen WK. Early versus delayed-interval laparoscopic cholecystectomy for acute cholecystitis: a metaanalysis. Surg Endosc. 2006;20:82-87. Summers SM, Scruggs W, Menchine MD, et al. A prospective evaluation of emergency department bedside ultrasonography for the detection of acute cholecystitis. Ann Emerg Med. 2010;56:114-122. Pedersen JH, Hancke S, Christensen B, et al. Ultrasonography, 99mTc-DIDA cholescintigraphy, and infusion tomography in the diagnosis of acute cholecystitis. Scand J Gastroenterol. 1982;17:77-80. Ralls PW, Colletti PM, Halls JM, Siemsen JK. Prospective evaluation of 99mTc-IDA cholescintigraphy and gray-scale ultrasound in the diagnosis of acute cholecystitis. Radiology. 1982;144:369-371. Ralls PW, Colletti PM, Lapin SA, et al. Real-time sonography in suspected acute cholecystitis. Prospective evaluation of primary and secondary signs. Radiology. 1985;155:767-771. Tulchinsky M, Colletti PM Allen TW. Hepatobiliary scintigraphy in acute cholecystitis. Semin Nucl Med. 2012;42:84-100. Shakespear JS, Shaaban AM Rezvani M. CT findings of acute cholecystitis and its complications. AJR Am J Roentgenol. 2010;194:1523-1529. Adusumilli S Siegelman ES. MR imaging of the gallbladder. Magn Reson Imaging Clin N Am. 2002;10:165-184. Park MS, Yu JS, Kim YH, et al. Acute cholecystitis: comparison of MR cholangiography and US. Radiology. 1998;209:781-785. Bennett GL, Rusinek H, Lisi V, et al. CT findings in acute gangrenous cholecystitis. AJR Am J Roentgenol. 2002;178:275-281. Boland GW, Slater G, Lu DS, et al. Prevalence and significance of gallbladder abnormalities seen on sonography in intensive care unit patients. AJR Am J Roentgenol. 2000;174:973-977. Jung SE, Lee JM, Lee K, et al. Gallbladder wall thickening: MR imaging and pathologic correlation with emphasis on layered pattern. Eur Radiol. 2005;15:694-701. Pedrosa I, Guarise A, Goldsmith J, et al. The interrupted rim sign in acute cholecystitis: A method to identify the gangrenous form with MRI. J Magn Reson Imaging. 2003;18:360-363. Sood B, Jain M, Khandelwal N, et al. MRI of perforated gall bladder. Australas Radiol. 2002;46:438-440. Yamashita K, Jin MJ, Hirose Y, et al. CT finding of transient focal increased attenuation of the liver adjacent to the gallbladder in acute cholecystitis. AJR Am J Roentgenol. 1995;164:343-346. Fayad LM, Holland GA, Bergin D, et al. Functional magnetic resonance cholangiography (fMRC) of the gallbladder and biliary tree with contrast-enhanced magnetic resonance cholangiography. J Magn Reson Imaging. 2003;18:449-460. Kim KW, Park MS, Yu JS, et al. Acute cholecystitis at T2-weighted and manganese-enhanced T1-weighted MR cholangiography: Preliminary study. Radiology. 2003;227:580-584. Lomas F Wagner HN, Jr. Accumulation of ionic 67 Ga in empyema of the gallbladder. Radiology. 1972;105:689-692. Waxman AD Siemsen JK. Gallium gallbladder scanning in cholecystitis. J Nucl Med. 1975;16:148-150. Ha L, Mansberg R, Van der Wall H,Magee M. Occult cholecystitis presenting as PUO demonstrated on Gallium. The Internet Journal of Nuclear Medicine. 2008;5:1. Ma HY Freeman LM. Acute gangrenous cholecystitis diagnosed on gallium scan. Clinical Nuclear Medicine. 2014;39:270-273 210.1097/RLU.1090b1013e31829a30183. Fink-Bennett D, Clarke K, Tsai D, et al. Indium-111-leukocyte imaging in acute cholecystitis. J Nucl Med. 1991;32:803-804. Mountford PJ, Kettle AG, O’Doherty MJ, Coakley AJ. Comparison of technetium-99m-HM-PAO leukocytes with indium-111-oxine leukocytes for localizing intraabdominal sepsis. J Nucl Med. 1990;31:311-315. Pounds TR Hattner RS. Normal cholescintigram in In-111 WBC positive acute acalculous cholecystitis. The converse photopenic ‘rim’ sign. Clin Nucl Med. 1994;19:483-485. Kiewiet JJ, Leeuwenburgh MM, Bipat S, et al. A systematic review and meta-analysis of diagnostic performance of imaging in acute cholecystitis. Radiology. 2012;264:708-720. Baker RJ Marion MA. Biliary scanning with Tc-99m pyridoxylideneglutamate--the effect of food in normal subjects: Concise communication. J Nucl Med. 1977;18:793-795. Klingensmith WC, 3rd, Spitzer VM, Fritzberg AR, Kuni CC. The normal fasting and postprandial diisopropyl-IDA Tc 99m hepatobiliary study. Radiology. 1981;141:771-776. Larsen MJ, Klingensmith WC, 3rd Kuni CC. Radionuclide hepatobiliary imaging: Nonvisualization of the gallbladder secondary to prolonged fasting. J Nucl Med. 1982;23:1003-1005. Down RH, Arnold J, Goldin A, et al. Comparison of accuracy of 99mTc-pyridoxylidene glutamate scanning with oral cholecystography and ultrasonography in diagnosis of acute cholecystitis. Lancet. 1979;2:1094-1097. Araki T. Cholecystitis: A comparison of real-time ultrasonography and technetium-99m hepatobiliary scintigraphy. Clin Radiol. 1980;31:675-679. Tulchinsky M, Ciak BW, Delbeke D, et al. SNM practice guideline for hepatobiliary scintigraphy 4.0. J Nucl Med Technol. 2010;38:210-218. Ziessman HA, Tulchinsky M, Lavely WC, et al. Sincalide-stimulated cholescintigraphy: A multicenter investigation to determine optimal infusion methodology and gallbladder ejection fraction normal values. J Nucl Med. 2010;51:277-281. Wu SD, Zhang ZH, Jin JZ, et al. Effects of narcotic analgesic drugs on human Oddi’s sphincter motility. World J Gastroenterol. 2004;10:2901-2904. Krishnamurthy S Krishnamurthy GT. Technetium-99m-iminodiacetic acid organic anions: Review of biokinetics and clinical application in hepatology. Hepatology. 1989;9:139-153. Choy D, Shi EC, McLean RG, et al. Cholescintigraphy in acute cholecystitis: Use of intravenous morphine. Radiology. 1984;151:203-207. Grund FM, Reinke DB, Larson BW, et al. Hepatobiliary imaging: The diagnostic use of intravenous morphine in fasting patients. Am J Physiol Imaging. 1986;1:26-32. Kim EE, Pjura G, Lowry P, et al. Morphine-augmented cholescintigraphy in the diagnosis of acute cholecystitis. AJR Am J Roentgenol. 1986;147:1177-1179. Louridas G, Botha JR, Esser JD, et al. Role of morphine administration with 99m-technetium-labelled di-isopropyl iminodiacetic acid in the diagnosis of acute cholecystitis. S Afr J Surg. 1987;25:148-150. Vasquez TE, Rimkus DS, Pretorius HT, Greenspan G. Intravenous administration of morphine sulfate in hepatobiliary imaging for acute cholecystitis: A review of clinical efficacy. Nucl Med Commun. 1988;9:217-222. Fig LM, Wahl RL, Stewart RE, Shapiro B. Morphine-augmented hepatobiliary scintigraphy in the severely ill: Caution is in order. Radiology. 1990;175:467-473. Flancbaum L Alden SM. Morphine cholescintigraphy. Surg Gynecol Obstet. 1990;171:227-232. Fink-Bennett D, Balon H, Robbins T, Tsai D. Morphine-augmented cholescintigraphy: Its efficacy in detecting acute cholecystitis. J Nucl Med. 1991;32:1231-1233. Kistler AM, Ziessman HA, Gooch D, Bitterman P. Morphine-augmented cholescintigraphy in acute cholecystitis. A satisfactory alternative to delayed imaging. Clin Nucl Med. 1991;16:404-406. Flancbaum L, Wilson GA Choban PS. 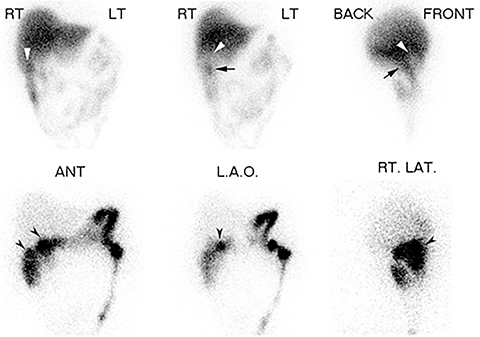 The significance of a positive test of morphine cholescintigraphy in hospitalized patients. Surg Gynecol Obstet. 1993;177:227-230. Kim CK, Juweid M, Woda A, et al. Hepatobiliary scintigraphy: Morphine-augmented versus delayed imaging in patients with suspected acute cholecystitis. J Nucl Med. 1993;34:506-509. Kim CK, Tse KK, Juweid M, et al. Cholescintigraphy in the diagnosis of acute cholecystitis: Morphine augmentation is superior to delayed imaging. J Nucl Med. 1993;34:1866-1870. Flancbaum L, Choban PS, Sinha R, Jonasson O. Morphine cholescintigraphy in the evaluation of hospitalized patients with suspected acute cholecystitis. Ann Surg. 1994;220:25-31. Flancbaum L Choban PS. Use of morphine cholescintigraphy in the diagnosis of acute cholecystitis in critically ill patients. Intensive Care Med. 1995;21:120-124. Oates E, Selland DL, Chin CT, Achong DM. Gallbladder nonvisualization with pericholecystic rim sign: Morphine-augmentation optimizes diagnosis of acute cholecystitis. J Nucl Med. 1996;37:267-269. Kim CK, Lim JK Machac J. Variable bile retention on cholescintigraphy after morphine administration. Eur J Nucl Med. 1996;23:1464-1467. Kim CK, Yun M, Lim JK, et al. Refinement of the positive predictive value of gallbladder nonvisualization after morphine administration for acute cholecystitis based on the temporal pattern of common bile duct activity. Clin Nucl Med. 2000;25:603-607. Kim CK, Palestro CJ, Solomon RW, et al. 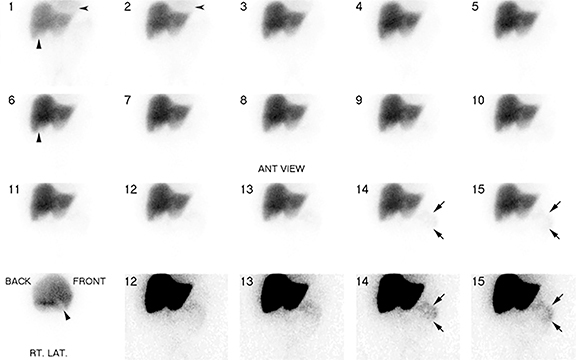 Delayed biliary-to-bowel transit in cholescintigraphy after cholecystokinin treatment. Radiology. 1990;176:553-556. Weissmann HS, Frank MS, Bernstein LH, Freeman LM. Rapid and accurate diagnosis of acute cholecystitis with 99mTc-HIDA cholescintigraphy. AJR Am J Roentgenol. 1979;132:523-528. Hasl DM, Ruiz OR, Baumert J, et al. A prospective study of bile leaks after laparoscopic cholecystectomy. Surg Endosc. 2001;15:1299-1300. Ramachandran A, Gupta SM Johns WD. Various presentations of postcholecystectomy bile leak diagnosed by scintigraphy. Clin Nucl Med. 2001;26: 495-498. Sandoval BA, Goettler CE, Robinson AV, et al. Cholescintigraphy in the diagnosis of bile leak after laparoscopic cholecystectomy. Am Surg. 1997;63:611-616. Siddiqui AR, Ellis JH Madura JA. Different patterns for bile leakage following cholecystectomy demonstrated by hepatobiliary imaging. Clin Nucl Med. 1986;11:751-753. Tan KG, Bartholomeusz FD Chatterton BE. Detection and follow up of biliary leak on Tc-99m DIDA SPECT-CT scans. Clin Nucl Med. 2004;29:642-643. Swayne LC Filippone A. Gallbladder perforation: Correlation of cholescintigraphic and sonographic findings with the Niemeier classification. J Nucl Med. 1990;31:1915-1920. Wilson DG Lieberman LM. Perforation of the gallbladder diagnosed preoperatively. Eur J Nucl Med. 1983;8:145-147. Weissmann HS, Badia J, Sugarman LA, et al. Spectrum of 99m-Tc-IDA cholescintigraphic patterns in acute cholecystitis. Radiology. 1981;138:167-175. Brachman MB, Tanasescu DE, Ramanna L, Waxman AD. Acute gangrenous cholecystitis: Radionuclide diagnosis. Radiology. 1984;151: 209-211. Freitas JE Gulati RM. Rapid evaluation of acute abdominal pain by hepatobiliary scanning. Jama. 1980;244:1585-1587. Mauro MA, McCartney WH Melmed JR. Hepatobiliary scanning with 99mTc-PIPIDA in acute cholecystitis. Radiology. 1982;142:193-197. Suarez CA, Block F, Bernstein D, et al. The role of H.I.D.A./P.I.P.I.D.A. scanning in diagnosing cystic duct obstruction. Ann Surg. 1980;191:391-396. Worthen NJ, Uszler JM Funamura JL. Cholecystitis: Prospective evaluation of sonography and 99mTc-HIDA cholescintigraphy. AJR Am J Roentgenol. 1981;137:973-978. Dickinson CZ, Powers TA, Sandler MP, Partain CL. Congenital absence of the gallbladder: another cause of false-positive hepatobiliary image. J Nucl Med. 1984;25:70-72. Warshauer DM Sulzer JL. Agenesis of the gallbladder. A rare cause for a false-positive hepatobiliary image. Clin Nucl Med. 1988;13:468. Kao PF, Huang MJ, Tzen KY, et al. The clinical significance of gall-bladder non-visualization in cholescintigraphy of patients with choledochal cysts. Eur J Nucl Med. 1996;23:1468-1472. Lane JI, Sacks D, Winn RS,Kershner MS. A false-positive hepatobiliary scan in a patient with cystic fibrosis. Clin Nucl Med. 1988;13:331-333. Gordon L, Ellis MC Schabel SI. Unusual causes for abnormal hepatobiliary scans. Clin Nucl Med. 1983;8:337-339. Weiss PE, Lanzafame RJ Hinshaw JR. Abscess adjacent to gallbladder. A new cause of false-positive DISIDA scan. Clin Nucl Med. 1985;10: 615-616. Nagler A, Enat R, Brenner B, et al. Hydatid cyst of the liver rupturing into the biliary tract—mimicking acute cholecystitis on hepatobiliary scanning. Am J Gastroenterol. 1985;80:819-821. Yang H, Alavi A Zhuang H. Significantly elongated sagging gallbladder can mimic intestine in hepatobiliary scintigraphy and cause false-positive interpretation for acute cholecystitis. Clin Nucl Med. 2006;31:292-294. Lecklitner ML, Rosen PR Nusynowitz ML. Cholescintigraphy: Gallbladder nonvisualization secondary to neoplasm. J Nucl Med. 1981;22:699-700. Nagle CE, Freitas J Dworkin HJ. Cholescintigraphy in cholecystic cancer. Clin Nucl Med. 1983;8:220-222. Saxton CR. Unusual presentation of carcinoid tumor as acute cholecystitis. South Med J. 1983;76:947-948. Kalff V, Froelich JW, Lloyd R, Thrall JH. Predictive value of an abnormal hepatobiliary scan in patients with severe intercurrent illness. Radiology. 1983;146:191-194. Lorberboym M, Machado M, Glajchen N, Pertsemlidis D. Transient false-positive hepatobiliary scan associated with ceftriaxone therapy. Clin Nucl Med. 1996;21:4-7. Chandramouli B, Gupta SM Cohen GE. Scintigraphic evaluation of bile dynamics before and after endoscopic sphincterotomy. Clin Nucl Med. 1994;19:800-802. Holbrook RF, Jacobson FL, Pezzuti RT, Howell DA. Biliary patency imaging after endoscopic retrograde sphincterotomy with gallbladder in situ. Clinical impact of nonvisualization. Arch Surg. 1991;126:738-741; discussion 741-732. Kao CH. Nonvisualization of gallbladder after endoscopic retrograde sphincterotomy. Semin Nucl Med. 1999;29:82-84. Lai KH, Peng NJ, Cheng JS, et al. Gallbladder function and recurrent stones of the biliary tract in patients after endoscopic sphincterotomy. Scand J Gastroenterol. 1996;31:612-615. Brown JF, Buchanan JW Wagner HN, Jr. Pitfalls in technetium-99m HIDA biliary imaging: duodenal diverticulum simulating the gallbladder. J Nucl Med. 1981;22:747-748. Gupta S, Rajagopal S, Chander R, et al. Giant duodenal diverticulum: a cause of false-positive findings of magnetic resonance imaging, cholangiopancreatography, and hepatobiliary scintigraphy. Clin Nucl Med. 2000;25:1037-1038. Shaffer PB Olsen JO. Differentiation of the gallbladder from the duodenum on cholescintigrams by dynamic display. Radiology. 1982;145:217-218. Subramanian KS, Freeman ML, Reznikov I, et al. Enterogastric reflux mimicking gallbladder visualization in acute cholecystitis. J Nucl Med. 1985;26: 961-962. Arose B, Shreeve WW, Baim RS, Atkins HL. Phantom gallbladder. A variant of the rim sign. Clin Nucl Med. 1987;12:457-460. Achong DM Oates E. The cystic duct sign during morphine-augmented cholescintigraphy. Clin Nucl Med. 1991;16:627-629. Coleman RE, Freitas JE, Fink-Bennett DM, Bree RL. The dilated cystic duct sign. A potential cause of false-negative cholescintigraphy. Clin Nucl Med. 1984;9:134-136. Tulchinsky M. SPECT/CT unequivocally depicts dilated cystic duct sign on hepatobiliary scintigraphy in acute cholecystitis. Clin Nucl Med. 2013;38: 149-152. Ripley SD Fink-Bennett D. Enterobiliary fistulae: A potential cause of a false-negative hepatobiliary study in the diagnosis of acute cholecystitis. Eur J Nucl Med. 1985;10:167-168. Borly L, Stage JG, Gronvall S, Hojgaard L. Cholescintigraphy in patients with acute cholecystitis before and after percutaneous gallbladder drainage. Eur J Gastroenterol Hepatol. 1995;7: 1093-1097. Mariat G, Mahul P, Prevot N, et al. Contribution of ultrasonography and cholescintigraphy to the diagnosis of acute acalculous cholecystitis in intensive care unit patients. Intensive Care Med. 2000;26: 1658-1663. Prevot N, Mariat G, Mahul P, et al. Contribution of cholescintigraphy to the early diagnosis of acute acalculous cholecystitis in intensive-care-unit patients. Eur J Nucl Med. 1999;26:1317-1325. Applied hepatobiliary scintigraphy in acute cholecystitis. Appl Radiol. Dr. Montini and Dr. Tulchinsky are with the Department of Radiology, Pennsylvania State University, The Milton S. Hershey Medical Center, Hershey, Pennsylvania. Disclaimers: Dr. Tulchinsky is an investigator, research grant recipient and consultant to Bracco Diagnostics Inc., manufacturer of sinalide and mebrofenin. Dr. Montini has no conflicts of interest to disclose.